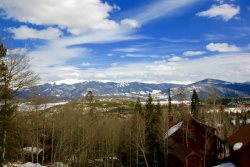 Frisco Colorado is a great hub for a Summit County vacation. Centrally located to the ski resorts and many other things to do, fun isn't far from your doorstep. With room for up to 13 guests, bring the whole gang these vacation homes have space for everyone including a wide variety of amenities and features as well! Start planning your Frisco Colorado vacation today by browsing available rentals below. The perfect vacation property awaits.